Bath’s Tabitha Miller (560) is back for her junior year. Information provided by coaches and online sources. 2017 postseason: Fifth at Ottawa District (Charis Barnes advanced to regionals as individual). Coach’s comments: We have a nice mix of youth and experience. Last year the team was fifth in the district. To repeat that level of success some of the younger runners will need to step up. They have been doing a great job of working hard so far during fall camp. 2017 postseason: Second at Ottawa District; seventh at Tiffin Regional. 2017 postseason: Ninth at Ottawa District (Sammie Unger qualified for regionals as individual). Coach’s comments: Kenton girls are still relatively young but full of talent. Only seven girls make up the girls team but four of them have some of the best times Kenton cross country had ever seen If we can stay healthy and get a solid five and six runner we should havve a rewarding season. Sammie Unger will lead the way as a returning regional qualifier from the 2017 season. Also, Kierra Krohmer will be a major contributor as she barely missed out of qualifying for regionals last year. Callie Wright ahs been running solid times as well. Senior Jenna Gibson will return after being out an entire season from injury. She led the team her freshman and sophomore years. We are excited to see how freshman Kylie Allmon contributes as well. 2017 postseason: 11th at Ottawa District. Coach’s comments: The O-G cross country team is motivated and excited to start the 2018 season.The girls team has five returning varsity members who are focused on team unity, maintaining proper nutrition, strength and mental toughness. As a team, our focus this year is to find strength within to persevere. 2017 postseason: Sixth at Ottawa District (Lexie Marshall advanced to regionals as individual). Coach’s comments: We have good numbers and look to improve as the season progresses. We will try to advance as many runners as we can in the postseason. Our depth and experience should contribute to overall success. 2017 postseason: Second at Ottawa District. Coach’s comments: Small girls team but very competitive with all six. Led well by Morgan Henschen. Will be very competitive in the WBL. 2017 postseason: 10th at Ottawa District (Caylee Phillips advanced to regionals as individual). and leave their mark on the legacy of the Van Wert cross country program. Our girls squad lost only one senior from the 2017 team, so we have a lot of experienced runners returning. Last year’s team was very young, and most of the runners on our varsity team were getting their first taste of varsity experience. So these returning girls are coming into 2018 with experience on their side and they are ready to make their mark on the Van Wert girls’ program. We have a core group of girls who are bought in to what we’re doing and have put in their best summer of work to date. We want to pop back into the top half of the WBL. After finishing sixth the last couple years, it is time for Van Wert to get back into the top four or five. We definitely have the pieces this year to make that jump. 2017 postseason: Ninth at Findlay Owens Community College District (Paige Schneider advanced as individual). Coach’s comments: We just like to run. Coach’s comments: We do not have a full girls team this year, but I am excited to see how these two girls are able to represent their school, and stretch themselves throughout the season to set new personal bests. I am proud of these two girls to run as individuals instead of deciding to not run since there is not a full team. Coach’s comments: We have two girls this year. Last year we had none. Hope to gain some more once school starts. 2017 postseason: Fifth at Ottawa District 1 (Ragen Harting and Ashley Bowen advanced to regionals as individuals); Harting qualified for state. Coach’s comments: This is one of Crestview’s largest turnouts for women’s cross country. The depth of the team will contribute to positive competition in practice. This will help our team improve as the season progresses. 2017 postseason: Won Ottawa District 2; third at Tiffin Regional; 12th at state finals. Coach’s comments: The team has four girls returning that competed at the state meet last season and a rounded squad with experience. With only one incoming freshman the team has a smaller squad this season. With little room for error we will need to stay healthy and competitive all season. A very positive outlook this season after coming off a successful 2017 season. The team is looking solid through our top four, but we will need to see some improvement and intersquad competition to fill out the remaining top seven to make a run through the tournaments this fall. 2017 postseason: Fourth at Ottawa District 1; seventh at Tiffin Regional; 19th at state finals. Coach’s comments: It will be a growing year for our girls team. Elyse Manz made it to regionals last year and she is looking to get back there for a chance to run at state. The rest of the ladies are working hard and are also shooting for goals that they are set for themselves. Can’t wait to see them compete and put all of the hard work they are given onto the course. Coach’s comments: The team has a lot of potential. It will be a year of learning and improving for new runners. 2017 postseason: Second at Ottawa District 1; 10th at Tiffin regional. Returning letter winners: Courtney Bye, Beth Honigford, Sara Honigford, Colby Homan, Maddie Steinke. Top prospects: Haley Alig, Paige Ayers, Lindsey Pease, Lily Schoenherr. Coach’s comments: I believe the girls have worked hard in the offseason to set themselves up for a good year. They want to run in November at the state meeting. With prayer, hard work, and health, we hope to be there. 2017 postseason: Sixth at Ottawa District 1 (Jenia Freewalt advanced to regionals). Top prospects: Rylee Pohlman (soph. ), Kitty Kopack (fr. ), Abby Shafer (fr. ), Addy Martin (fr. ), Adara Fuerst (fr. ), Nicole Pohlman (fr.). Coach’s comments: This is the largest girls team we have had at St. John’s in 20 years. We will be led by junior Jenia Freewalt who was a regional qualifier last year and is looking to returning this year. We are a young team with only one senior and one junior but the underclassmen are going to push the two of them. We will have good depth with our No. 2 runner to No. 7 runner that could be any of the other eight runners in any given meet. We have a had a good summer of training and are looking forward to get racing to see with our depth to see if we can compete with some of the top schools in the area that we have not been able to do the last 20 years due to the lack of numbers. 2017 postseason: Fourth at Ottawa District 2; 15th at Tiffin regional (Chloe Will advanced to state as individual). Coach’s comments: All varsity contenders from last year’s team return, along with Alyssa – a freshman, so we expect there to be a lot of inter-squad competition, which should fuel continuous improvement. This group is very coachable, so as we work on pack running and race strategy, we will focus on better team finishes and build off of the momentum started by senior Chloe Will at last year’s state championship. 2017 postseason: Third at Ottawa District 1; 12th at Tiffin regional (Kelsey Broering advanced to state as individual). Coach’s comments: With four returing varsity runners, the Marion Local girls are looking to return to the regional meet. The girls will be led by two-time state qualifier Kelsey Broering. Coach’s comments: We bring back several runners with a lot of experience. We will just focus on getting strong and taking one meet at a time. 2017 postseason: Third at Ottawa District 2; 13th at Tiffin Regional. Returning letter winners: Andrea Heitkamp, Alana Speelman, Jessica Fledderjohann, Alayna Thieman, Tess Lane, Carson Wyatt, Hanna Tenkman, Molly Smith. Coach’s comments: Expectations for the season – Work hard at every practice, respect teammates, and push to achieve individual and team goals set at the beginning of the season. We have a great group of girls out this year with a lot of potential. They will all be working hard to earn one of the top seven positions leading up to sectionals. 2017 postseason: Eighth at Ottawa District 2. 2017 postseason: Sixth at Ottawa District 2. Coach’s comments: This team has a lot of talent and potential. My goal for them is to build up their confidence so that they can make it to regionals as a team. 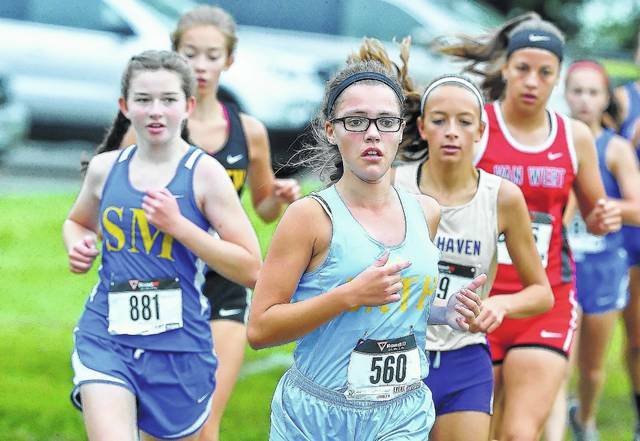 The returning runners have experienced the competiveness orf the district meet, which should help them this year. The three new runners (Leah ran in junior high) will help push the other girls. It should be an exciting season. 2017 postseason: Second at Ottawa District 2; fourth at Tiffin regional; 13th at state finals. Coach’s comments: We’re excited to continue to improve upon last year. We return a great core group of runners and have others ready to step into the spots left by last year’s seniors. We look to keep everyone healthy, get faster as the season progresses, and have the best finish in school history. 2017 postseason: No team score (Taylor Lucke advanced to regionals as individual); Lucke advanced to state. Coach’s comments: Hannah is coming off a very nice freshman year in cross country and a very successful track and field season this past spring. She will lean on that experience this fall to continue to improve and get better. Hannah will be the lone girl this year for Kalida cross country. 2017 postseason: Eighth at Ottawa District 1. Returning letter winners: Claire Rigel (sr.), Peyton Henry (sr.). Coach’s comments: Small in numbers, we are still trying to build a program. This is only four fourth year with the program back after a 20-plus year absence. Just trying to better our times from last season. Coach’s comments: We had two girls graduate (McKenna Byrne and Brittney Schleeter). Paige Hoersten was our top runner last year. Hope she advances to regional this year. 2017 postseason: Finished seventh at Cedarville District (Emma Koenig advanced as individual); Koenig qualified for state. 2017 postseason: Emily Sreenan advanced to regionals as individual; Sreenan advanced to state; Sreenan finished 11th at state finals. Coach’s comments: The number of girls are up, and the passion and drive for success will be the team’s goals. With this being my first year as the head coach for the Lady Spartans, my goal is for this season to be the beginning of something special at Lima Senior High. Being a Lima Senior 1977 graduate, and a cross country standout there, my passion is to build a team that will Minster in the future. This group of girls is beginning with some good talent being developed for the future.